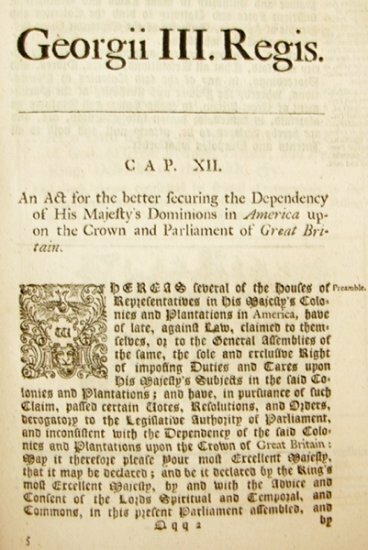 AN ACT for the better securing the dependency of his Majesty's dominions in America upon the crown and parliament of Great Britain. That the said colonies and plantations in America have been, are, and of right ought to be. subordinate unto, and dependent upon the imperial crown and parliament of Great Britain; and that the King's majesty, by and with the advice and consent of the lords spiritual and temporal, and commons of Great Britain, in parliament assembled, had, hash, and of right ought to have, full power and authority to make laws and statutes of sufficient force and validity to bind the colonies and people of America, subjects of the crown of Great Britain, in all cases whatsoever. II. And be it further declared ..., That all resolutions, votes, orders, and proceedings, in any of the said colonies or plantations, whereby the power and authority of the parliament of Great Britain, to make laws and statutes as aforesaid, is denied, or drawn into question, are, and are hereby declared to be, utterly null and void to all intents and purposes whatsoever. Colonial legislatures organized what is now known as the Stamp Act Congress in response to the Stamp Act of 1765 which called into question the right of a distant power to tax them without proper representation. Thus Parliament was faced with colonies who refused to comply with their act. The repealing of the Stamp Act came about due to a number of reasons, one of which was the protests that had occurred in the colonies. Perhaps more important though were the protests that arose in Great Britain from the manufacturers who were suffering from the colonies' non-importation agreement. 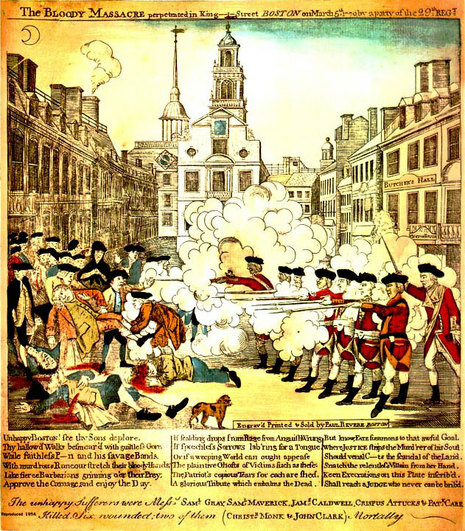 Normally the economic activity in the colonies wouldn't have caused such an outcry, but the English economy was still suffering from its post-war depression from the French and Indian War. Another reason that the Stamp Act was repealed was the fact that George Grenville, the Prime Minister who had enacted the Stamp Acts, had been replaced by Rockingham. Rockingham was more favorable towards the colonies, and furthermore he was rather antagonistic to any policy that Grenville had enacted. Rockingham invited Benjamin Franklin to speak to Parliament about colonial policy, and he portrayed the colonists as in opposition to internal taxes (which were derived from internal colonial transactions) like the Stamp Act called for, but not external taxes (which were duties laid on imported commodities). Parliament then agreed to repeal the Stamp Act on the condition that the Declaratory Act was passed. On March 18, 1766, Parliament repealed the Stamp Act and passed the Declaratory Act. In other words, the Declaratory Act of 1766 allowed Parliament to make laws and changes to the colonial government.